It's easy to see what a new floor style will look like. You can try on a sweater before you buy it. So why not a new floor? 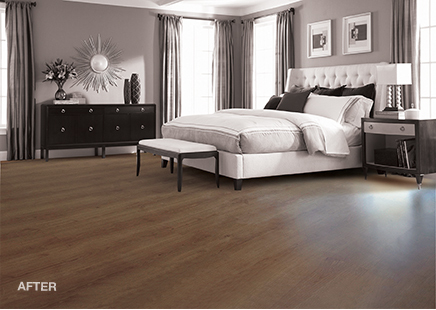 Introducing the My Floor Style App from Flooring America. Just download the app to your smartphone—or use our desktop friendly platform on any browser—and upload a picture of the room you’d like to remodel. Then use your finger or mouse to outline your current floor and swap it out for any of our thousands of options. It’s that easy. So download My Floor Style on the iTunes or Google Play stores today, or click here to use the web version. Step 1: Take a photo of your room. Use My Floor Style to take a photo of your room or select an existing photo on your tablet device. Step 2: Outline and remove your floor. Remove the floor in your room photo by dropping pins to outline the flooring surface. Step 3: Add a floor style to your room. Select a flooring category, and choose from a wide range of swatches to drop the floor into your photo. You can then adjust depth, orientation and more with a simple tap. Step 4: Save and share your project. When you’re finished, view before and after photos to compare, save your project to reference later, or even share your photo via email, text or social media to see what friends and family think.